How can I understand varicose veins and spider veins? 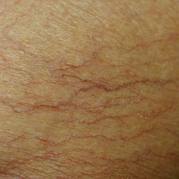 How can I understand varicose veins and spider veins ? We are often asked about veins in the feet, especially he patch of fine red lines that occur commonly there. It can be difficult to get your head around, but I like to have people think of it like this. In your body, you have only one artery that supplies each body part. Mess these up and you will suffer consequences determined by which part becomes oxygen starved and dies. This might mean a stroke or a heart attack or perhaps some gangrene in the foot from absence of oxygen that comes via the blood. The vein system is different. You have multiple sets of veins that go to each of the body parts. Roughly, you start using the deeper, bigger veins when you are young. These naturally fail as times go by (which is normal) and you start to use the next set out, then the next set and so on. Eventually, there is enough blood flowing through the outermost ones that you can see them – either as big purple varicose veins in the leg or a patch of tiny red lines called spider veins (technically Telangectasia). These spider vein patches are often confused for a rash because of their red appearance.